The Yangtze, rising in the glaciers and snow– covered mountains of the “Roof of the World”, the Qinghai-Tibetan Plateau, and fed by hundreds of tributaries, wanders eastward across the mainland of china. It makes an incessant rush into the East China Sea. The enormous inexhaustible hydroelectric resources of the Yangtze, producing no waste gases, no waste water, or waste residues, is superior to oilfields and coalfields and therefore considered the “King” of all energies capable of generating huge profits with a minimum input. From its source to its estuary, the Yangtze River meanders over 6,300 kilometers. The Three Gorges, the most spectacular section of the Yangtze River, are filled with breathtaking sceneries. With Baidi City, Fengjie in Chongqing Municipality to the west end and Nanjin Pass of Yichang in the Hubei province at the east, the Three Gorges, Qutang, Wu and Xiling, total 192 km in length. The Qutang Gorge, known for its magnificence, is only 8 km long. Wu Gorge, 44 km long, is famed for its deep valley and quiet beauty. Among the twelve peaks, the Goddess Peak is the most exquisite. 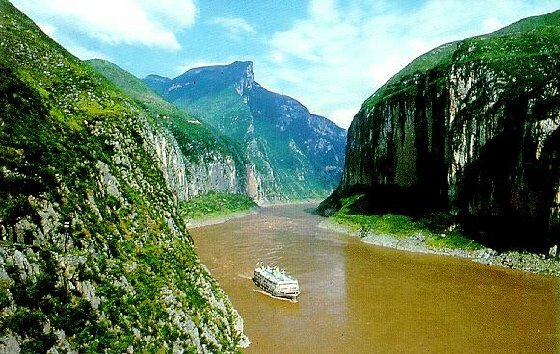 Xiling Gorge, extending 66 km in length and full of turbulent currents and whirlpools, is one of the most dangerous shoals. Along the Three Gorges, there are broad valleys, where the climate is mild and the soil fertile. These valleys are the main cultivated areas in the Three Gorges, where the county towns of Wushan, Badong and Zigui are located. In the autumn when the orange ripens, its sweet fragrance drifts to the boats on the river. In addition to their scenic beauty, the Three Gorges are rich in water resources. They are the most ideal section of the Yangtze for building large water conservancy projects for the comprehensive exploitation of the river. The deep gorges and steep mountains on the banks of the river present superabundant potentials for power generation. The Three Gorges Project that is being under constructed will effectively control the torrential flow on the upper reaches and free the middle and lower reaches from the threat of flood. Huge power generators will send electricity to many parts of the country. The dangerous navigation channel will then be submerged in a placid lake. The Three Gorges will present an entirely different picture.